• Single Wheel WT. : 25,500lbs. • Double Wheel WT. : 38,500lbs. Two underground fuel storage tanks for Avgas and Jet fuel with continuous fueling with credit card. The Fairfield County Airport serves the growing Route 33 Corridor and the southeastern Metro Columbus area. With only three stoplights between the airport and downtown Columbus, travelers can make the 26-mile drive to the city center in less than 30 minutes. 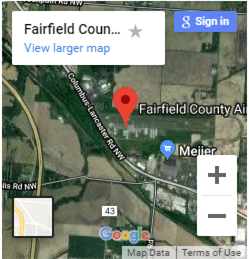 When you add the convenience of the easy access from plane to car as well as avoiding the busy traffic patterns over Columbus, using the Fairfield County Airport becomes a great alternative to busier airports in the region. Its proximity to Lancaster and the Hocking Hills make it the primary airport for access to those areas. For more information, please contact us here. Fairfield County is also a great place to start or expand your business. It’s the second fastest growing county in the fastest growing region in the Midwest and sits right between Ohio University and Ohio State. Plus, with an abundance of water, natural gas, and low-cost land, it can fit most business’ growth needs. For more information, contact the Fairfield 33 Alliance.